Some notable Oregonians did not remain Oregonians – they shot through the country in the days of Oregon Territory and early statehood and moved on. Peter Burnett and Osborne Russell come to mind. Both men served, for good or for ill, in Oregon’s Provisional Government and then moved south where Burnett was elected the first governor of California. Of equal accomplishment, but less well-known is William Henry Rector (1806-1890). Rector, before he and his wife Ann (1806-1891) moved to California, was an Oregon trailblazer, legislator, and minter of Beaver coins, wool manufacturing innovator, and Superintendent of Indian Affairs. The Rectors were among Marion County’s most productive citizens from 1845 to 1865. William and Ann, and their six children, traveled the Oregon Trail in 1845. Fortunately for students of Oregon history, Rector wrote a memoir in 1882 when he was seventy-five years old. This pithy recollection was published in Fred Lockley’s History of the Columbia River Valley: From The Dalles to the Sea. Upon reaching The Dalles, Rector joined a group which decided to blaze a trail south of Mount Hood and into Oregon City. People were reluctant to risk their lives on a water passage down the Columbia. The two point men marking out the initial trace were Rector and Samuel Barlow, for whom the toll road was later named. Rector was twelve years Barlow’s junior and took the lead in working through forty miles of old growth fir, cedar, hemlock. After six days of bushwhacking, the two men finally pressed through the Cascades and into Oregon City. For the first few months in Oregon the family stayed near the Oregon City area and stocked up on provisions. The Rectors took their bearings and in 1846 moved south into Marion County (Marion County was formed out of the old Champooick District/Champoeg County; the name change occurred in 1849). They settled along Mill Creek just to the north of today’s Turner Road, and south of what became the Aumsville highway. Their claim included the land where Corban College is now located. William and Ann proved their claim under the Oregon Donation Land Act which took effect in December 1850. Under this law, a man who had worked his claim for four years prior to the implementation of the act was entitled to 320 acres of land, and his wife was, in her own right, entitled to another 320. They filed in Oregon City and secured a claim of 639.12 acres. The claim was formally surveyed after the Willamette Meridian Range and Township Marker was established in 1851. The Donation Land Act honored the majority of the claims which had first been farmed and filed under the Oregon Provisional Government, even though that earlier government ceased to exist in 1849. The Rector children – Ludlow, Benjamin, John, Volney, William and Theresa – gained three siblings after the family settled along Mill Creek. Ann gave birth to twins, Casius and Alwilda on June 14, 1847. The last of their children, Adrienne, was born on April 2, 1851. Ann knew tough times, as was all too common in those days. As William puts it in his journals: “I married Ann Perkins an orphan girl enured to hardships as well as myself this act I never had occasion to regret.” Sadly, the twins lived short lives. Alwilda died in 1848 and Casius in 1858; the records do not describe cause of death. 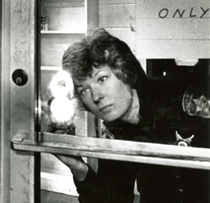 Notwithstanding, once it came to light that some of the women taken hostage had been abused, talk ended and a ramshackle Oregon Volunteer force set out to exact retribution. Rector also had his hand in the minting of what became known as Beaver Money. Following the return of hundreds of Oregon men from the California gold fields in 1849, estimates put the value of gold dust and nuggets circulating in the territory at between two and three million dollars. Here was an opportunity for the unethical to try their hands at chicanery. Some merchants rigged their scales to gain more dust than a true ounce and some miners mixed in yellow sand with their gold to deceive proprietors. In order to put the gold in a regulated and fungible form, Rector “proposed” a “coin making enterprise to the Provisional legislature.” The legislature agreed to the plan despite the fact that the Oregon Territory’s newly appointed federal officials were about to take over the reins of government. The dies [molds] were made by Hamilton Campbell and the “press and rolling machinery by Rector.” They minted both five and ten dollar coins in the amount of $58,500. 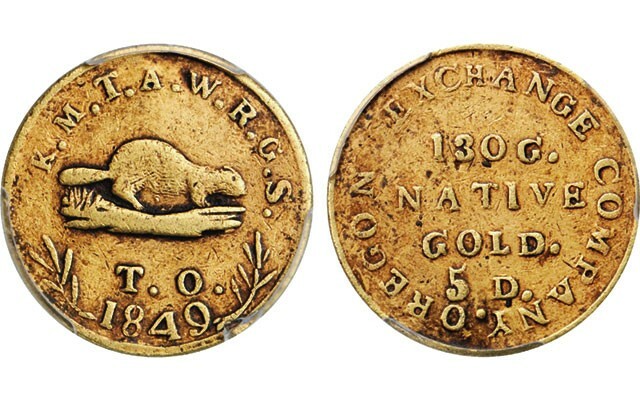 Ultimately, the federal government called these coins in to the San Francisco mint in 1854, but none of the men involved in the Beaver Money project were prosecuted as law breakers given the unsettled nature of the country and the government in those days. 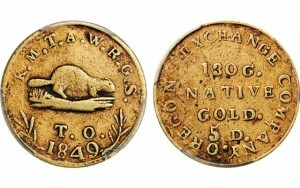 Today, if you are lucky enough to own one, Beaver Coins are worth a small fortune. The territorial legislature tapped into the skills of the Rector family in 1854 by awarding Rector a contract for $14,940 to complete the first Oregon territorial capitol building. 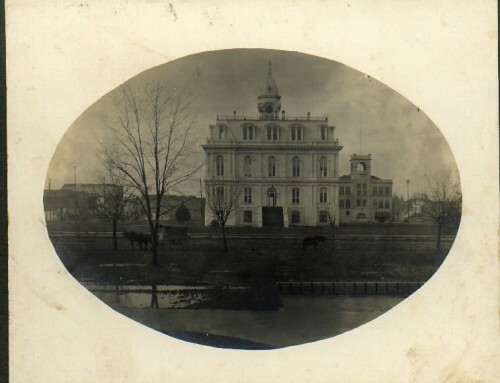 Up until that time, the legislature had been meeting in various buildings, including classrooms at Willamette University, and in the Rector Building, a building which had been constructed along Commercial Street in downtown Salem in 1851. The new capitol was a two-story wooden building and was constructed using a neo-classical Greek Doric architectural plan. Four large columns were evenly spaced across the façade of the building. The bicameral legislature’s two central meeting halls were completed and in use by December of that year. Each legislator was also provided with a desk and writing materials. Work continued on additional rooms for the capitol project, but it was destined for a short life. The new capitol burned down on December 30, 1855. The suspicion has remained ever since that arsonists from Corvallis, who wanted Corvallis to replace Salem as the territorial capital, had torched the building. Even if this was the case, no one was ever convicted for this presumed crime. By this time the Willamette Valley was fast becoming a center of animal husbandry, and the market for raising sheep and producing woolen commodities was ripe for venture capitalism. Rector was a prime move in this endeavor, and as Oregon judge Matthew Deady noted in a meeting of Oregon pioneers in 1875, “Rector was no ordinary man, amid the sneers and indifference of the community, he projected and established in 1857 the pioneer woolen mill of the Pacific Coast.” As one of the mill’s five directors, Rector was selected to be the purchasing agent for Willamette Woolen Manufacturing Company. He traveled to the East Coast, visited several mills in order to learn the ins and outs of the industry, and then bought essential mill machinery from the Davis and Furber Company of Andover, Massachusetts. Rector exuded the confidence of an honest businessman. Davis and Furber allowed him to purchase $12,000 in equipment while making a down payment of only $2,500. The new mill machinery was shipped to Oregon by way of the isthmus of Panama. The mill project also involved digging a one mile “raceway” in order to divert water from the North Santiam River into Mill Creek. The ditch was completed under Rector’s guidance during the summer of 1857. Historian Alfred Lomax notes that this was a “sizable achievement when compared with the present day methods of handling a similar project.” In November there was a large celebration in Salem to mark the completion of the raceway and mill buildings. Part of the festivities included the celebrants securing explosives atop an anvil whereon they dropped another anvil and set off an explosion. 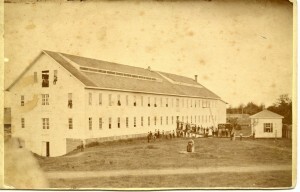 The mill suffered a temporary setback during the exodus of men to the new gold fields in British Columbia in 1858. In fact, the logo of the company was “hard times,” but the industry quickly righted itself with the increased demand which came with the Civil War. 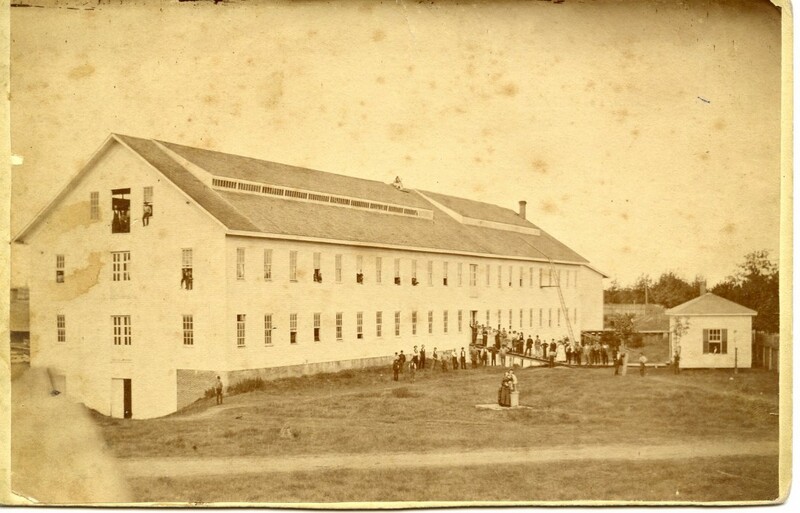 The Willamette Woolen Mill burned down on May 3, 1875, and Salem was without a mill until the establishment of the Thomas Kay Woolen Mill in 1889. One additional sad note about Rector’s tenure as Indian superintendent must be mentioned. In the summer of 1862, Umatilla Indians decided to force a small group of white settlers out of eastern Oregon’s Grand Ronde Valley. The casus belli was the conviction of the Blue Mountain tribes – Nez Perce, Cayuse, Walla Walla, Umatillas, et al. – that at the Great Walla Walla Council of 1855 they had never surrendered sovereignty over this valley which had been a center of Indian commerce for generations. In his parlay with the Umatilla leaders, Rector records that the chiefs told him “they did not sell Grand Ronde valley, in the Blue Mountains, while the treaty defining the boundary is so clear that there could not have been any misunderstanding. The treaty was produced, read, and interpreted to them…They said the record lied, but their ears did not lie.” Regardless of the Indian’s convictions, Rector approved an attack against a band of Umatillas who had placed no trespassing poles in the northern end of the valley. A cavalry detachment from Fort Walla Walla killed four Umatillas and forced the remaining Indians out of the valley. White settlement of the valley resumed. By this time the Rectors had sold their land claim, one half to their son, Volney, and the other half to the Salem meat merchant, Thomas Cross, and were living in town. It was the wool industry that drew the Rectors south to California. At the invitation of the State Agricultural Society of California, Rector successfully represented the Willamette Woolen Manufacturing Company at the state fair in Sacramento in 1859 Charles Crocker, who helped to finance the nation’s first transcontinental railroad line, liberally bought the Oregon woolen products. This was at the beginning of Civil War days, and Rector was not pleased when “ardent friends of the Rebellion” bought a controlling interest in the stock of the Salem mill and proceeded to mismanage its affairs. Alfred Lomax writes that wealthy interests in California then gave Rector financial “inducements” to leave Oregon in 1865 and set up a cotton mill near Oakland. 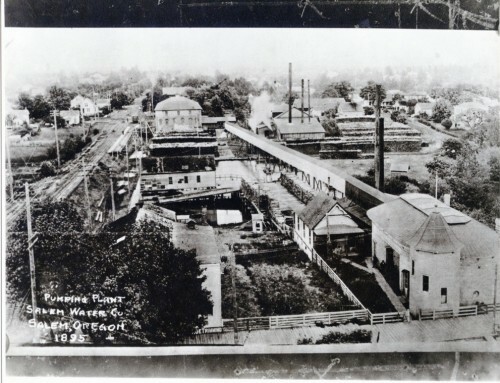 The mill adventure in Oakland did not go well for William, and he and Ann spent the later years of their lives near Santa Rosa in Sonoma County, where Rector helped to run the Mark West Woolen Mills. Their son, Benjamin Franklin Rector, also moved south to California. Volney Rector may have moved to California, but the records are not clear. The two oldest sons, Ludlow J. and John P. Rector, settled Donation Land Claims in Oregon’s Linn County. Ludlow married Jane Stanley in 1849. She was the daughter of Thomas and Margaret Stanley, and was raised on the Donation Land Claim immediately to the north of the Rector claim. William Henry Rector remained a productive worker to the very end of his life which came on February 23, 1890. Ann died on December 24, 1891. The Rectors had come to Oregon (as the Santa Rosa Daily Republican described William in an obituary) as people who were “full handed.” This is an apt description. The family was full of courage, ideas, talents and tenacity. The Barlow Trail, Beaver Money, the capitol building, Willamette Woolen Manufacturing Mill, Indian reservation policies — all are evidence that in the mid nineteenth century the Rectors had left their stamp on Oregon, and, more to the point, on Marion County history. Peter Burnett was a leader in the provisional legislature between 1843 and 1848. Sadly, he was an advocate for the anti-Black segregation laws which were passed by the legislators and remained on the Oregon books until the early twentieth century. Russell was a well-known mountain man who published a famous journal of his trapping days. Russell served as a member of the provisional government’s three man executive committee in 1844 and was a supreme judge within the judicial branch. Fred Lockley, History of the Columbia River Valley: From The Dalles to the Sea. Chicago: The S.J. Clarke Publishing Company, 1928). 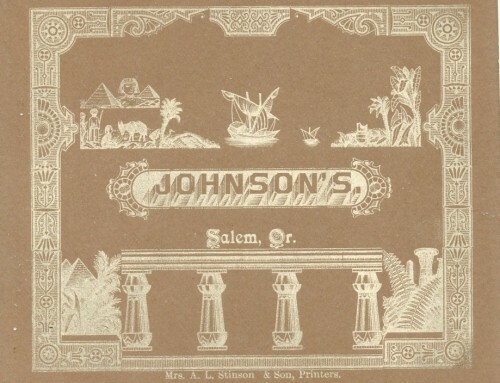 This work is included in the Hugh Morrow Collection of the Salem Public Library. Lockley, History of the Columbia River Valley, p 1070. Ibid. Also of note, when Rector and Barlow returned to intercept their party, Rector decided to take his family back to The Dalles and risk rafting the Columbia. He was concerned that October mountain snows would trap the settlers in the mountains. He was nearly right, those who decided to press over the mountains with wagons experienced rough weather and great hardships. Lewis A. McArthur, Oregon Geographic Names. 4th ed. 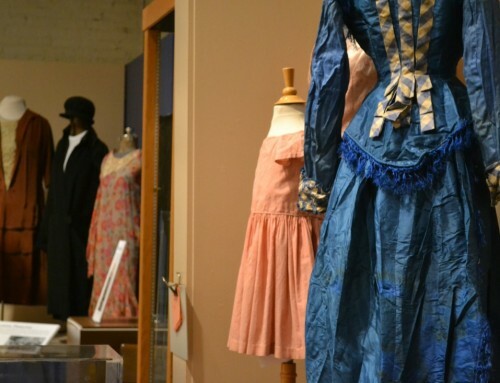 (Portland: Oregon Historical Society, 1974), 466-467. Edgar Williams & Co. Historical Atlas Map Marion & Linn Counties, Oregon 1878, (Salem: Marion County Historical Society, 2004 reprint), 46. William Henry Rector, “Biographical Sketches of the Life of William Henry Rector – Written by Himself; Introduction by Fred Lockley” The Oregon Historical Quarterly, Vol. XXIX (December 1928), p. 328. Terrence O’Donnell, An Arrow In The Earth: General Joel Palmer and the Indians of Oregon (Portland: Oregon Historical Society Press, 1991), p. 71. Lockley, History of the Columbia River Valley, p. 1078. Charles Henry Carey, History of Oregon, Vol 1 (Chicago-Portland: The Pioneer Historical Publishing Company, 1922), p. 407. Howard McKinley Corning, ed. Dictionary of Oregon History (Portland: Binford & Mort Publishers, 1956), p. 24. Carey, History of Oregon, p. 407-408. Corning, Dictionary of Oregon History, p. 24. R.J. Hendricks, “Bits for Breakfast”, Oregon Statesman, (July 5, 1935), p. 4. Saundra Moore, “Oregon’s First Capitols, 1853-1876”, Marion County History: Centennial Edition, Vol. 5, Marion County Historical Society (June 1959), p. 13-16. William Henry Rector, “Biographical Sketches of the Life of William Henry Rector – Written by Himself; Introduction by Fred Lockley “The Oregon Historical Quarterly, Vol. XXIX (December 1928): p. 323. Alfred L. Lomax, Pioneer Woolen Mills in Oregon: History of the Wool and Woolen Textile Industry in Oregon: 1811-1875 (Portland: Binford and Mort, Publishers, 1941), p. 108. Carey, History of Oregon, p. 796. Lomax, Pioneer Woolen Mills, p. 159. E.A. Schwartz, The Rogue River Indian War and Its Aftermath, 1850-1890 (Norman and London: University of Oklahoma Press, 1997), 161-184. Allen, Cain, The Oregon History Project, “Report by William H. Rector, 1862”, Report of the Commissioner of Indian Affairs (Portland: Oregon Historical Society) Catalog Number ARCIA1862-260. Lomax, Pioneer Woolen Mills, p. 126. Sonoma County Library, “In Memoriam” (Santa Rosa; Daily Republican, February 25, 1890). Edgar Williams & Co. Historical Atlas Map Marion & Linn Counties, Oregon 1878, (Salem: Marion County Historical Society, 2004 reprint), p. 62, 80. 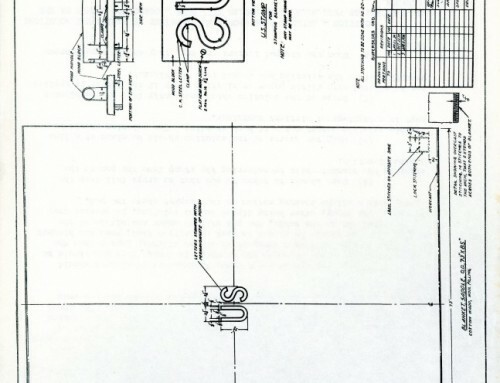 Marion County Historical County files.